I've never been a big beer drinker, but there are a few kinds of beer that I do enjoy. One of them has always been Tiger beer, a nice balanced Malaysian beer. It's one my husband, Brad, more the beer connoisseur than I, has always enjoyed as well. 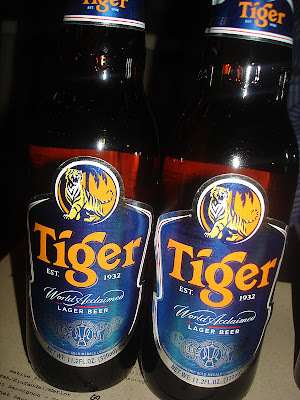 Recently, I got the opportunity to be treated free of charge to a Tiger beer and fish curry food pairing at Masak, a Singapore-influenced restaurant down in the East Village courtesy of the folks at Tiger Beer. Coming into the experience, I knew I liked Tiger beer but wasn't sure about the pairing of fishhead curry. Boy was I surprised. The curry was delicious and I enjoyed the tender, flaky fish and rice with the homemade Singapore-style curry. The dish was fantastic and Brad enjoyed it as well. Just goes to show that it pays to be a bit more adventurous in your eating style! You just have to be careful of the bones, but the fish was very tender and Masak's curry sauce was delicious. Delicious fishhead curry at Masak - no need to be afraid, it's super good! The curry flavors paired well with the smooth, exotic flavor of the Tiger beer. The beer really brought out the flavor of the curry and it was a truly excellent pairing. Next time I'll have to try making a curry dish at home and serve it with some Tiger. In addition to the beer and curry we were treated to, we also purchased a couple of excellent appetizers at Masak as well - we got little Qui Pie Tee (little pastries) filled with hen of the wood mushrooms and duck, as well as the crispy duck croquettes. All and all this was an exotic and fun drinking and eating experience and an excellent way to enjoy Tiger beer and Malaysian/Singapore-style food!